Gautier Quéru has been appointed Investment director, infrastructure/renewable energy funds, Mirova Environment & Infrastructure, reporting to Raphaël Lance. He will notably be involved in managing the Eurofideme 2 fund and creating new funds dedicated to renewable energies. Gautier Quéru started his career in 2004 as an analyst at the French Ministry of Economy and Finance, specialising in energy and environmental issues. He joined CDC IXIS (later to become Natixis) in 2005 to take part in the creation of the European Carbon Fund (ECF) with assets of €143m, dedicated to greenhouse gas emissions reduction projects. After having held the positions of investment officer and then portfolio manager, he was appointed Fund Manager in 2010. In the last eight years, Gautier has contributed to the structuring, investment and management of the ECF, comprised of 27 projects in Latin America, North Africa, China and India and representing total CO2 emission reductions of close to 65 million tonnes. A qualified engineer and graduate of French engineering school ENSEEIHT, Gautier Quéru is also a graduate of Institut d’Etudes Politiques de Paris. This new appointment underscores Mirova Environment & Infrastructure’s ambition to become a major player in renewable energy infrastructure fund management in Europe. Mirova, the Responsible Investment division of Natixis Asset Management, develops an engaged approach aiming to combine value creation and sustainable development. 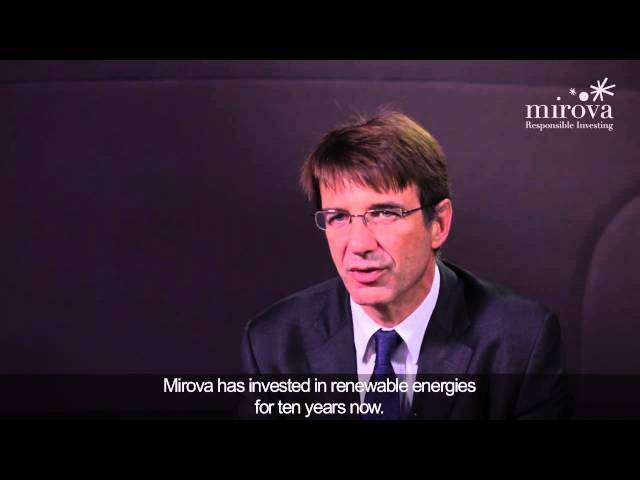 Mirova’s philosophy is based on the conviction that integrating sustainable development themes in investment approaches can generate solutions that create value for investors over the long term. Mirova offers a global responsible investing approach with a unique offering built on 4 pillars: listed equities, infrastructure, Impact investing(1), voting and engagement. Mirova Environment and Infrastructure, a fully-owned subsidiary of Natixis Asset Management, is an investment fund management company specialising in project financing for renewable energy infrastructure in Europe and public private partnerships for a wide variety of projects in France (universities, hospitals, urban transport, etc.). With its four funds, Fideme, Eurofideme 2, Fideppp and Fideppp 2, Mirova Environment and Infrastructure represents a total commitment of over €393 million* in infrastructure projects as of 31 March 2013. Natixis Asset Management ranks among the leading European asset managers with €297.2 billion in assets under management and 682 employees. Natixis Asset Management offers its clients (institutional investors, companies, private banks, distributors and banking networks) tailored, innovative and efficient solutions organised into six investment divisions: Fixed income, European equities, Investment and client solutions, Structured products and volatility (developed by Seeyond(2)), Global emerging and Responsible Investing (developed by Mirova(2)). 1 Impact investing: investments with a strong social and environmental impact. 2 Mirova and Seeyond are brands of Natixis Asset Management.